Can Ghee Be a Healthy Substitute for Butter? How Does It Affect Your Health? 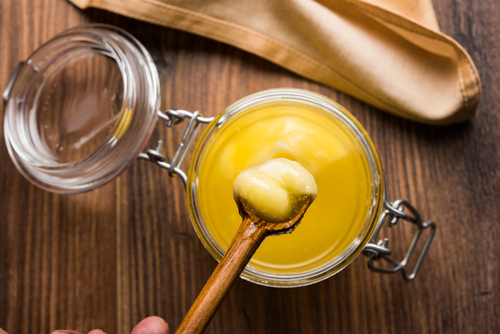 You may have seen the product ghee pop up recently in your local supermarket or health food store, and may be curious to what exactly this food product is. Ghee is simply a form of butter which is simmered longer, which not only brings out more flavor from this form of butter, but also further breaks down milk sugars and proteins. This means that products made with ghee is going to be much easier for people to digest on a whole, as this process eliminates the allergens responsible for lactose intolerance. Another benefit to ghee versus traditional butter is that due to the longer simmering process, the fatty acid chains found within the ghee are further broken down. These smaller fatty acid chains are more easily broken down and digested by the body, and these smaller chains are also not associated with heart disease or cardiovascular problems like the longer ones found in butter. 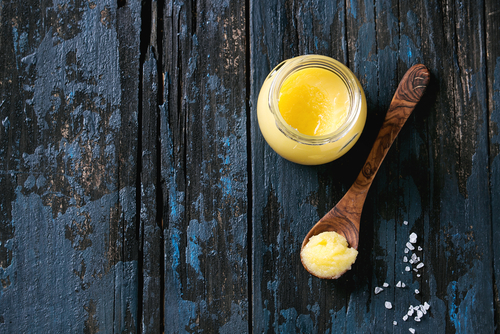 It seems as if ghee can be a better alternative to butter, but what other benefits can it provide, and how can it be used in the kitchen? The number one benefit to using ghee over other oil based products in the kitchen is that it has a high smoke point compared to other oils out there. Ghee doesn’t burn until you hit at least 450 degrees Fahrenheit, which is up there with palm oil. This is a higher burning point than canola oil, which is one of the most popular and widely used oil to lubricate flying pans, pots or whatever you’re using to cook your food. The only other oils that come close are palm oil which is generally considered to be unhealthy due to its high “bad” fat concentration, and avocado oil which is both rare and expensive. Another huge benefit of using ghee over other similar products is that it is rich in many fat soluble vitamins, which are readily available to the body due to the simmering process. Ghee is rich in vitamins A and E, both of which are powerful antioxidants and play important roles in maintains good health. Vitamin A is essential for good skin and eye health, while vitamin E helps to repair damaged tissue. Another benefit of ghee is that it contains vitamin D. Vitamin D is one of the nutrients scarcely found in our foods, the sun being our number one source of this mineral. Many of us do not get enough sun exposure to get enough of this vitamin, especially in the winter months. Ghee can help make up this difference. Ghee tastes rich and creamy like butter, however it has the added benefit of having a nuttier flavor as well. This means that you should be able to get away with using less of it than you would if you were to use butter instead, which can help reduce your caloric intake as well. Due to the fact that many of the larger fatty acid chains are broken down during the preparation of ghee, it can not only be beneficial to your cardiovascular health, but may help you lose fat overall as well. The smaller chains of fats found in ghee are easier for the body to breakdown, synthesize and use as energy to carry out other processes. Ghee also helps to ramp up our metabolism also, which in turn increases calories burned and fat lost. The shorter fatty acid chains found in ghee as opposed to butter means that the body has an easier time breaking down and processing the material as well. As mentioned prior ghee also contains plenty of antioxidant vitamins which are going to reduce inflammation and help to maintain the health of the digestive tract. 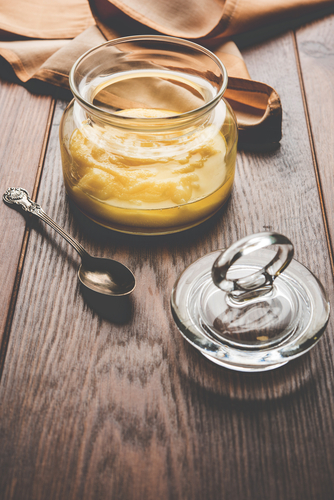 Ghee is becoming more mainstream and is more widely used by people today that was even five years ago. This means that is becoming more prevail and in even your chain grocery stores such as Trader Joe’s. You can also find this product like many other health products at your local health food store if your local supermarket doesn’t carry it.